The landscape of Roero could be considered as the natural setting of Vivaldi's "Four Seasons": its is full of colours, sounds and scents. You will discover all this magical atmosphere in Castellinaldo, a small village in the green heart of Basso Piemonte, a land which abounds in fruits and wines. 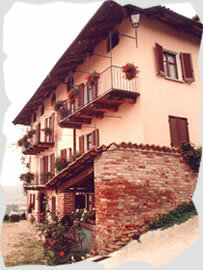 "Il Borgo" is a restored old house which will offer you a unique atmosphere through its rooms which have been built with old typical materials.